Erik Per Sullivan has grown up since we last saw him on Malcolm in the Middle and is starring in the new film MO. MO, an inspirational, stylized independent movie from first-time director Brian Scott Lederman. MO is an amusing, yet poignant true story about a boy living with Marfan syndrome, a serious connective tissue disorder. MO was the centerpiece film at this year’s Malibu International Film Festival, premièred on April 14th. No information on general release yet, but we will keep you updated. Subscribe to the RSS feed to get the news first! Frankie Muniz: Go, Speed Racer, Go! What happens when you’re going more than 100 mph and you have to, well, go? Frankie Muniz, racecar driver, reveals all! Get behind the wheel with the former Malcolm in the Middle star, now 21, as he competes in the Long Beach, Calif., Grand Prix and find out what happens when you drink lots of water before hitting the track – plus more from behind the scenes. 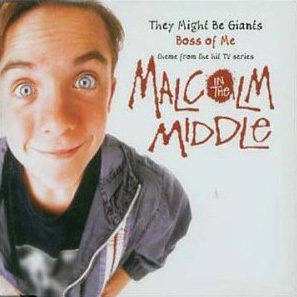 The band who created the ever catchy “Boss of Me” song for Malcolm in the Middle are back with a new album. When not busy making children’s albums or writing TV theme songs, They Might Be Giants still find time to work on new records. The Else, the band’s twelfth album in 25 years, will be released July 10. The record was produced by the Dust Brothers and Patrick Dillett. In addition to the previous 11 albums, the band is known for writing the theme songs for The Daily Show with Jon Stewart and Malcolm in the Middle, which won a Grammy in 2002. TMBG will hit the road for most of the rest of this month making their way around America. Malcolm in the Middle Voting Community is Back! New Voting Community Site for all your Malcolm in the Middle needs!